NOTE Robert and Rita have the surname Bruce. They knew Joy and Ray Thomas very well over many years and kept in close touch, which is how they knew so much. I also knew both of them, Ray from 1986 and Joy later on. We were at an interview together at Brindavan in 1994. Rita told of Joy and Ray Thomas that they have moved into P.N. permanently, Sai having asked them 3 times "Do you really want to live here?" (and they answered 3 yesses!) Now they regret it bitterly - no peace at all, 2 tiny rooms (R 1 A4) and 24 hr building noise plus people who sit and talk outside etc. They had no medical insurance in the U.S.A., so thought they'd be safer here. But no one is allotted to push her wheelchair (in the ladies' side etc. ), so she has to hire a pusher. She recently had some medical checks and there was something wrong with the platelets in the blood - possible/probably cancer. 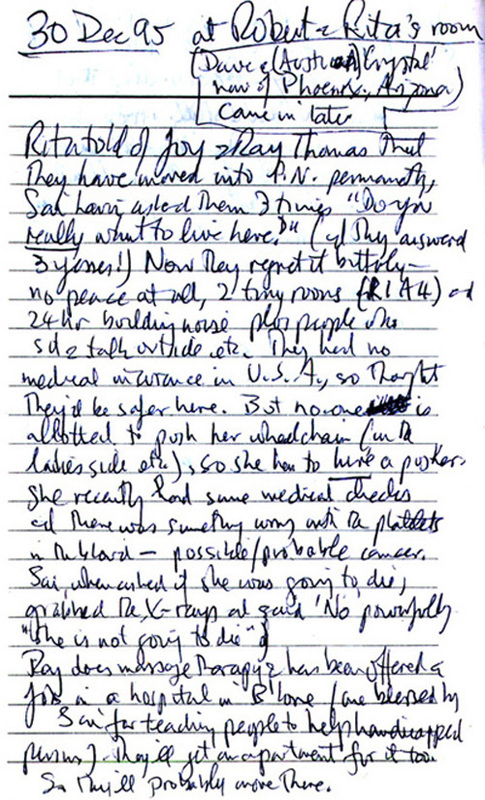 X-rays and said powerfully "She is not going to die"
Comment: Yet again, Sai Baba shows either that he is telling a conscious lie or that he does not know her future, for in the event, Joy Thomas did die. Sai Baba has frequently said that one must adhere rigorously to the truth and that even a 'white lie' is unacceptable. It is better, he said, to say nothing. Joy Thomas reportedly bled to death in Sathya Sai Baba' s own hospital, attended by a Dr. Singh, one of Sai Baba's favourites. Glen Meloy, who knew Ray Thomas, told that Ray has been very disturbed by the event and the lack of care she received, but there was nothing he could do about it. Once in the hands of a Sai Hospital, one has no recourse to any normal patient rights as it is supposedly all the will of Sai that rules everything. Ray does massage therapy and has been offered a job in a hospital in B'lore (one blessed by Sai for teaching people to help handicapped persons). They'll get an apartment for it too. So they'll probably move there. A Lady at darsan had a small lapdog with her. Sai called her into the interview room and she had her dog along. She said to Swami (whether he was going to get rid of his dogs, the Alsatian, Doberman & Boxer. Sai said he had no dogs. Yes, she said, in the Public Relations and Accommodation offices! Comment: Sathya Sai Baba's 'selfless servitors' - with a few laudable exceptions are more like slave masters towards many foreigners. They can be nice sometimes, if you don't get on the wrong side of them, but it is very easily done! 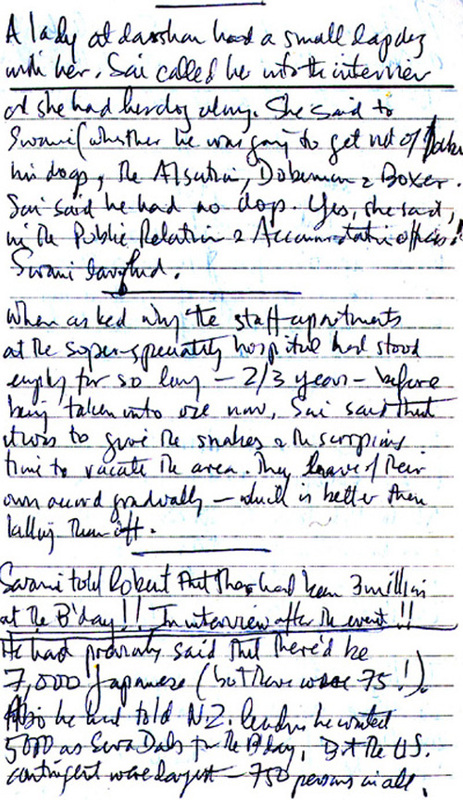 When asked why the staff apartments at the super-specialty hospital had stood empty for so long - 2/3 years - before being taken into use now, Sai said that it was to give the snakes and scorpions time to vacate the area. They leave of their own accord gradually - which is better than killing them off. Comment: When Sai Baba cannot explain away wastage and other results of corruption and failure, he invents something... usually unlikely. But devotees love any of his answer as showing inscrutable divine insight, even though they cannot really understand them! This was another example of wasteful mismanagement in his affairs... like the white elephant Sathya Sai Airport, for which the cost was borne by the Indian taxpayers. and the offset printing press donated from the US which was left in the rain to rust at Brindavan. Examples can be multiplied. Swami told Robert that there had been 3 million at the B'day! In interview after the event!! Also he had told N.Z. leaders that he wanted 5,000 as Seva Dals for the B'day, But the U.S.A. contingent were largest - 750 persons in all.